The DoubleQueue USB 2.0 Y Cable was created to the exacting standards of leading WWAN hardware manufacturers. Hence, it wasn't cheaply or poorly designed like many competing cables. The DoubleQueue USB 2.0 Y Cable had to pass rigorous testing of standards bodies like the FCC, USB-IF, and others before inclusion in OEM packages for major wireless carriers. DoubleQueue USB 2.0 Y Cable's quality starts with the split for the power cables, occurring in the plug where there is the most shielding and the least amount of stresses from movement. Many USB 2.0 Y cables are split mid-cable, which is why they aren't standards compliant. DoubleQueue's connectors meet or exceed the USB-IF exacting requirements, and its highest quality EMI shielding assures USB 2.0's maximum throughput of up to 480Mbps. This focus on quality makes the DoubleQueue USB 2.0 Y Cable the best choice when deploying the MicroU2E family of adapters with the range 3G/4G WWAN devices like the Kyocera KPC680 or Option Wireless GT Max 3.6 Express. It is also excellent for powering USB 2.0 based hard drives, and SSD devices requiring extra electrical current. 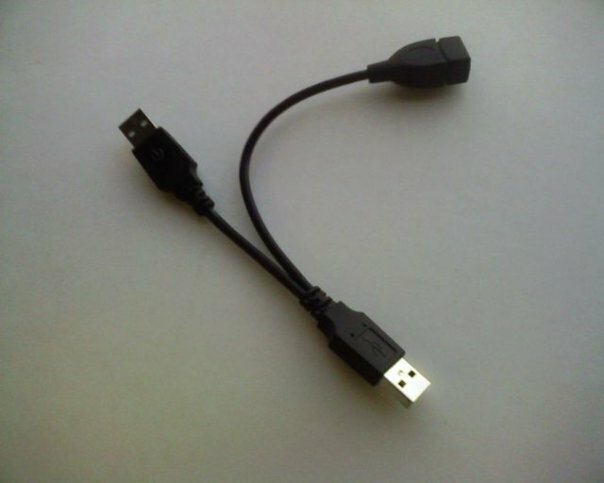 DoubleQueue USB 2.0 Y Cable features two upstream male A connectors, one for data and power, one for power only, and provides a downstream female A connector. Designed for notebooks and computers without enough current at their USB 2.0 ports, DoubleQueue's ability to draw power from a second port allows power hungry devices. The DoubleQueue USB 2.0 Y Cable's ability to provide up to 1000mA to 1200mA when used with 500mA ports, and up to 600mA when used with 300mA ports. Providing a female A receptacle allows DoubleQueue to accept USB male A cable ends and devices like the MicroU2E-MV. The DoubleQueue USB 2.0 Y Cable can be used as a normal USB 2.0 extender cable simple by using the data and power portion of the cable only.